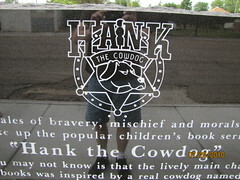 Tales of bravery, mishchief and morals make up the popular children's book series "Hank the Cowdog"
What you may not know is that the lively main character in these books was inspired by a real cowdog named Hank who lived and worked the Y_ Ranch of rural Forgan. 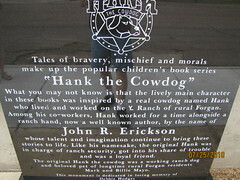 Among his co-workers, Hank worked for a time alongside a ranch hand, now a well known author, by the name of John R. Erickson whose talent and imagination continued to bring these stories to life. Like his namesake, the original Hank was in charge of ranch security, got into his share of trouble and was a loyal friend. 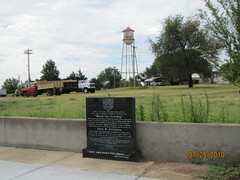 The original Hand the cowdog was a working ranch dog and beloved pet of lontime rural Forgan residents Mark and Billie Mayo. 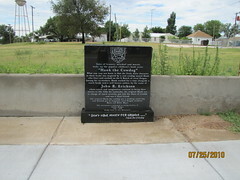 This monument is dedicated in loving memory of Debbie Hodges 1956 - 1978. 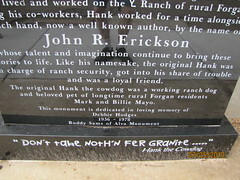 "Don't take noth'n fer granite ....", Hank the Cowdog.